We are proud to announce that Crest de Ville Community Association has selected Tinnelly Law Group as their association legal counsel. 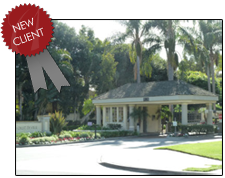 This gated community in Laguna Niguel is just minutes from Salt Creek Beach and Pacific Coast Highway. Many of the large lots have canyon and ocean views. In addition to the fantastic location, Crest de Ville has a pool and a spa for the residents to enjoy. Our HOA attorneys and staff are privileged to have the opportunity to work with Crest de VIlle’s Board and Management.